The World Baseball Classic is on. United States vs. Puerto Rico are playing the final game to see who will be the champions. Puerto Rico has been playing seven undefeated games through out the season and United States actually lost a game to them. I have been pumped, excited, and cheering like a crazy woman, “¡Wepa!” during all of the games. It was in that moment that I realized that I have been doing a good job on raising a bicultural and bilingual child. A child that although has never lived in Puerto Rico, feels a deep connection to the island, to the culture, and to the people. This post may contain affiliate links. I received a complimentary copy of this book for purposes of review. All opinions are my own. Read my full disclosure here. However, getting to this point wasn’t easy. Many times, I found myself at a crossroads between balancing two cultures for our son. Not knowing how to raise a bicultural child I created heritage board for him when he was 3 1/2 years old. I was desperately looking for ways for him to connect with both cultures; and at times felt that one would “take over the other” (which is not true). My son is a true Southern boy! For instance, why does my child insist on having gravy on his arroz con gandules (Puerto Rican rice with pigeon peas). Whaaaaat?! Ha! I struggled with this but soon came to realize that his upbringing is bicultural. He will always have a good dose of his African American culture because we live in the U.S.A. but it is up to me to make sure he has an equal dose of his Latino culture as well. Back in 2008, I wish I had the book Arroz con Pollo and Apple Pie by Maritere Rodriguez Bellas. In Chapter 3, Maritere explains that it is possible to balance two cultures. It is inevitable when raising bicultural children. Remember my dilemma about finding a balance? This is the Latino parenting book I needed when my baby was born! Maritere’s book is a compilation of stories collected throughout the years, and she too shares her own struggles as well. This book is for the immigrant mother, for the second or third generation Latino parent, for the single Latino parent or any one who is raising bicultural children. Another chapter that really touched me was Chapter 6. I love how she talks about disciplining your children bi-culturally. How we questioned how our own parents disciplined us, yet we are like them; and how to find the perfect balance. You will find topic like this, and much more in every-single-chapter. 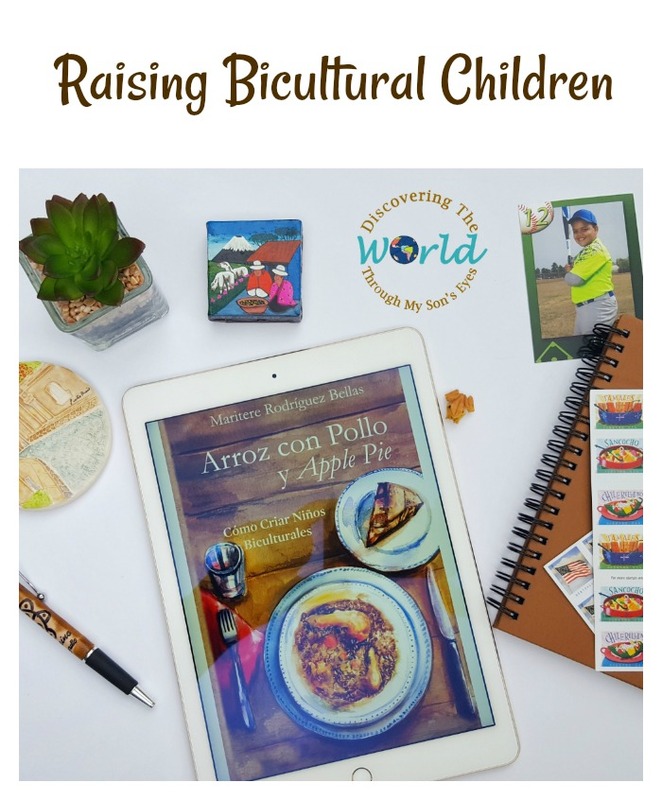 Arroz con Pollo and Apple Pie will make you laugh, will make you smile and will make you feel that you’re not alone in this bicultural journey. It is a Latino parenting book with resources, tips, anecdotes, and of course, the author’s very own arroz con pollo and apple pie recipes. Clikck here to learn more about the author Maritere Rodriguez Bellas.